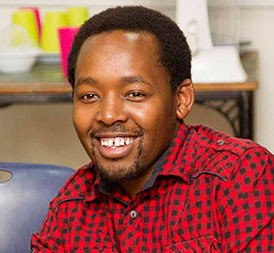 I'm a #Nairobi based freelance product designer, project manager and design thinker. I am passionate about technology and the impact it can have on people's lives. I sit at the intersection of technology and business. Using design thinking techniques, I have worked with different organizations to understand their technological needs and identified strategies that would allow them to make the best of technology. My specialty is product design - figuring out the problem by engaging the different stakeholders, working with the development team to quickly prototype & test the solution, and taking the product to market and growing its usage. iHub, Nairobi's premier innovation hub, through the consultancy unit enables different organizations to leverage its immense talent pool to implement business solutions. The consultancy unit at the iHub is made up of scrum masters, researchers, design thinkers, UX & UI designers, system architects, and web & mobile application developers. The consultancy unit offers market research services, digital product design, development, and support by leveraging the immense talent at its disposal. As the director of the unit, my primary responsibilities was business development, team management (recruiting, capacity building, retention), and took lead on product development for our customers. I also acted as the main customer satisfaction agent ensuring that we delivered quality products and that our clients were happy. Within the wider organization, as part of the leadership team, I was involved in defining the company strategy and making sure that it is executed well. As the Consulting Lead my primary role was identifying & nurturing talent, business development, developing a strategy to ensure continued growth, and facilitating the execution of projects. I played an important role in the ideation process as it was always the most critical part of the project. This is based on my understanding that a significant number of things are unclear at the beginning. I also took the lead in developing and implementing processes that would ensure we consistently delivered quality projects. We ended up with a software consultancy team that combined human-centred design principles and agile software practices to deliver software. Within the period I was heading the unit, it grew from a fringe department at the iHub to one of the main strategic units that were driving the iHub. The team grew from one to five full-time employees and seven consultants who were used 60% each month. Software development with a focus was on back end development and API development & integration. Complimented existing teams to offer the necessary capacity needed and also took on projects in collaboration with other freelancers. Managed projects for organizations with existing teams or outsourced development. Verviant provides custom software solutions ranging from web applications, desktop applications to mobile applications. My role involved software design, implementation, testing, debugging and deployment.